There is a temptation in local church leadership to slow down during the summertime. Resist that temptation. Now is the time to start planning and working on your Christmas Giving Campaign. It’s critical that you don’t leave this project until late in the fall. 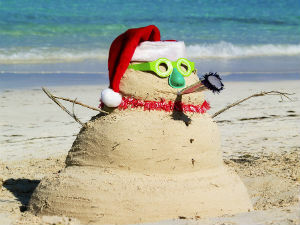 Here are some reasons to start working on your Christmas campaign while it’s still hot outside! The Fall Goes Fast // It seems like a long time away but it isn’t. Once Labor Day hits, it feels like only days until Thanksgiving and then a few more moments until New Years. Having your plan for the end of the year locked and loaded in the summer prevents your leadership from being caught in the fall rush. Generosity Cycle // Multiple studies show that somewhere between 25%-33% of all charitable giving is made in the month of December. Although we are attempting to teach people to be generous all year long, we know that a large percentage of them give additional gifts in the last few weeks of the year. Battle the Slump // Typically, churches experience a decline in giving during the summer months. It’s a motivating time to focus your leadership on how you will come out of that slump later in the year. You’ll also have a better sense of where your year is trending after the summer slump and how much you need to make up in December. Other Non-Profits // In the last 60 days of the year, people are barraged by every other charity they have ever contributed to. Those non-profits started working on their year-end giving strategy in January. We need to present our church well in the midst of that communication. Understand the Needs // The needs in your community often shift and change throughout the calendar year. During the summer, you have a sense of where you church needs to move to address the needs around it. Shift the Schedule // An effectively executed Christmas Giving Campaign requires time in your schedule. You’re going to need to make shifts in how you invest your energy this fall … summer is the best time to move things around. Let’s be honest: we wish people would just give a regular percentage of their income throughout the year. They don’t. We need to build a strategy to help them give at the end of the year because we know that’s their pattern. How can you start building your strategy now to have a boost in your church’s revenue in the last 45 days of this year? Download this broad overview of the various activities you’ll need to be involved in this fall to have a successful Christmas Giving Campaign. All you need to do is modify the date field of the last Sunday that you are hosting services and it will auto-populate a timeline to direct your planning. Yes! I love the Rocket Company. They are the real deal. Thanks again for dropping in!